Did you know that the University of Southern Mississippi has one of the world’s leading programs in Polymer Science and Engineering? Just up the road from us in Hattiesburg, MS. Yes, I am digressing, yet where would we be today without PVC and the other polymer plastics we use in every aspect of everything we do all day, every day? 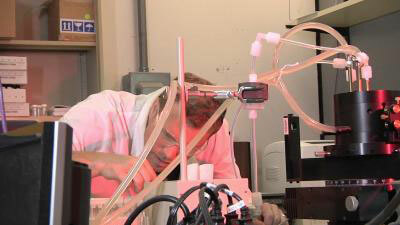 The University of Southern Mississippi School of Polymer Science and Engineering has world-class research facilities. The program even includes studying ways polymers can be used in pharmaceutical delivery in vivo. Yes, U.S.M. also has three letters. Short lengths of PVC pipe are inexpensive to purchase, and even cheaper if you ask a building site for their scraps. 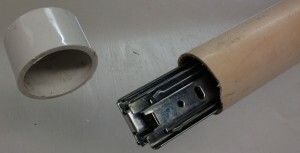 If you keep a variety of diameters in two foot lengths, they make great storage for your projects’ drawer slides while you are sanding and finishing. Because most related hardware comes pre-lubricated, any dust in the environment will be attracted to it and gum up the moving parts. Get a couple of PVC caps at about a dollar each and your hardware is protected. Let the caps sit in place with a friction fit (no glue) and you can work from either or both ends. Free pipe and $2 worth of caps and your pre-lubricated drawer slides are protected from dust and trauma. OK, so it’s an ugly piece of pipe! Who cares? It’s free! Jim Randolph is a veterinarian in Long Beach, Mississippi. His earlier careers as lawn mower, dairy farmer, automobile mechanic, microwave communications electronics instructor and journeyman carpenter all influence his approach to woodworking. His favorite projects are furniture built for his wife, Brenda, and for their children and grandchildren. His and Brenda’s home, nicknamed Sticks-In-The-Mud, is built on pilings (sticks) near the wetlands (mud) on a bayou off Jourdan River. His shop is in the lower level of their home. Questions and comments on woodworking may be written below in the comments section. Questions about pet care should be directed to his blog on pet care, www.MyPetsDoctor.com. We regret that, because of high volume, not all inquiries can be answered personally.